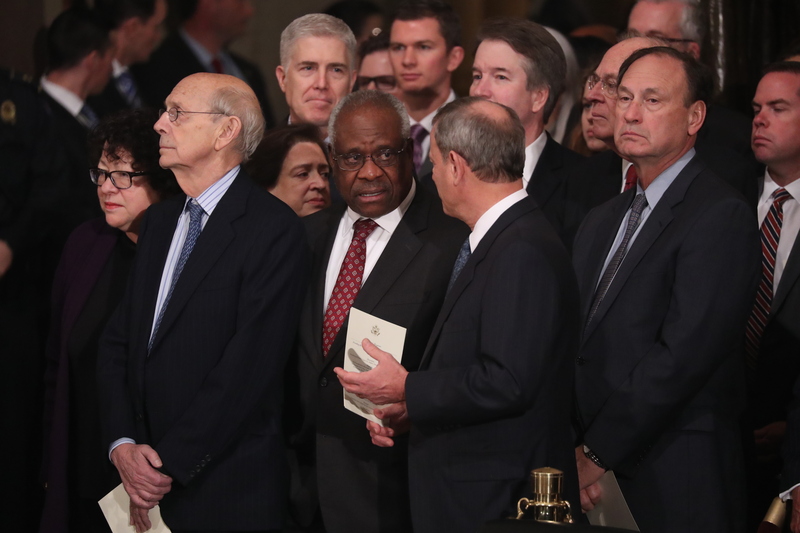 Supreme Court Justice Clarence Thomas did something extraordinary on Wednesday. Appearing before the Supreme Court is rather like meeting your spouse’s family for the first time. The questions are relentless, probing and impolite. One hundred questions over the course of an hour-long argument is typical. Attorneys arguing cases can expect an interruption from a justice just moments into their presentation, and it is not unusual for the justices to interrupt one another. Yet Thomas is generally an observer at the blood sport that is oral argument. Since taking the bench in 1991, he has rarely asked questions of the attorneys arguing before the Court. His silent stretches run so long (he did not ask one question from 2006 to 2016) that the very fact of his speaking is a news event. The questions he asked Wednesday, in a dispute concerning racism in jury selection, were his first questions in almost three years and his second intervention this decade. Thomas is alone in this approach to argument among his colleagues. His silence draws curiosity and ire in equal measure, particularly since he is widely regarded as the most gregarious of the justices. Scholarly treatment of Thomas’s silence is similarly mixed. One 2017 journal article in the Northwestern University Law Review from Professors RonNell Andersen Jones and Aaron Nielson compiled and reviewed every question Thomas has ever asked during oral argument, encompassing his service on the Supreme Court and his prior work on the U.S. Court of Appeals for the D.C. Circuit. Jones and Nielson concluded that Thomas is an adept questioner who should intercede more often. “Reviewing these questions demonstrates that although Thomas has not frequently spoken, when he has posed questions, they have been thoughtful, useful, respectful, and beneficial to his colleagues of whatever ideological stripe,” the study reads. “Putting aside the merits of textualism as an ending point, or even as a starting point, in statutory interpretation, the merits of having an active voice in oral argument that demands investigation of and discussion about the statutory language seem incontrovertible,” they write. “With Justice Antonin Scalia’s departure from the Supreme Court, the need for a justice to ask these sorts of questions is obvious,” they add. When Thomas does ask questions, Jones and Neilson say, they tend to come near the end of the argument. His Wednesday inquiries came during a brief rebuttal period, only after the attorney asked if there were any remaining questions. The justice himself speculated that his delicate approach to questioning is a function of his southern pedigree during an event at the University of Kentucky in April 2012. Perhaps more than any other justice in modern history, Thomas is intensely interested in course correction. He does not believe the Court ought to abide by cases which offend his vision of the Constitution, and he regularly invites litigants to bring challenges to foundational decisions he believes are wrong. In February alone he released opinions criticizing and New York Times v. Sullivan (a landmark freedom of the press case), Gideon v. Wainwright (establishing a right to counsel for indigent defendants) and Roe v. Wade. Thomas is a prolific opinion writer who has pressed his judicial philosophy over dozens of lone dissents and concurring opinions. Karp says Thomas could better advance his own views and enrich the Court’s internal debate by contributing to oral arguments. “Because of his willingness to rethink the constitutional order, Justice Thomas would force the Court to reconsider basic premises,” Karp added. Karp believes the role of oral argument in the deliberative process makes Thomas’s silence especially strange. The justice told Newsweek in 2007 that his views on a given case are well-developed by oral argument. Before arguments he reads legal briefs from both sides, additional filings from interested parties, the decisions below, the record of facts, and discusses his thoughts with his law clerks. As such, in Thomas’s view, the argument is not especially important to the disposition of a case. But Karp is skeptical of that perspective, arguing that it is unbelievable that even the most gifted jurist could approach the complex work of the Supreme Court without questions. The Supreme Court will hear cases through Wednesday touching partisan gerrymandering and the power of federal agencies. Sarah George and Paul Ingrassia contributed research.